Nick Eynaud doesn't just want to be famous. He wants to be rich, famous and powerful, the triple threat. 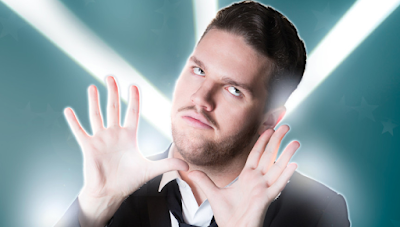 His 2015 Melbourne Fringe Festival cabaret show, A Star Is Bored, reveals the lengths he will go to in order to make his dream come true - so long as he doesn't actually have to do anything to earn it. Thanks to reality TV, he might be able to make that happen. Eynaud takes us on a journey of his life that begins with his wide-eyed WAAPA school days through to the harsh reality of living back home with his parents in Reservoir. Along the way, he informs us of his obsession with Netflix and more specifically, reality TV shows; including Masterchef, Real Housewives and Toddlers and Tiara - the latter resulting in an incredibly hilarious audition tape that needs to be seen. It would be difficult to choose any stand out numbers in this show, as each one is brilliantly funny. However, Eynaud's rendition of the Kate Bush classic "Wuthering Heights" as a Netflix ode and the location change to Reservoir in Hairspray's "Good Morning Baltimore" would be right up there. All songs are cleverly written and are not only infused with a good dose of humour but also bring out Eynaud's winning personality. The use of mixed media is a welcome addition to the show, with the opening moments including Eynaud’s show reel of his “starring roles” in productions such as Wicked and Phantom of the Opera. The childhood photos shown throughout remind us that this person has a real history and in turn, made him all the more vulnerable and sympathetic on stage despite the jokey self-entitlement being projected. A Star Is Bored is essentially Eynaud's self-discovery that at some time, we all need to grow up, even just a little. You can still dream to be rich, famous and powerful but with a small dose of real 'reality' for sanity's sake. A Star Is Bored is a great showcase of Eynaud's own star qualities and a highly enjoyable hour of cabaret. A Star Is Bored was performed at The Butterfly Club as part of the Melbourne Fringe Festival on 23 -27 September.